Here's a look at all six girls State Group Championship meets. Watchung Hills pulled off a shocking win for its first state title, Shelby Bigsby broke a very old record, and Abby Loveys and Sydney Hawkins lit up the track to highlight action in Group 4. After finishing third, 26 points behind the champion North Hunterdon at the North Jersey, Sec. 2 meet last week, Watchung Hills came into this meet an understandable huge underdog. But with three athletes doing all its scoring, the Warriors edged runner-up South Brunswick, 36-32 1/2, to win its first state championship. Mahogany Jenkins won the long jump (18-5) and the (37-3 3/4), Lauren Baeyens placed third in the 1,600 and fourth in the 3,200, and Portia Jones was third in the 400. That added up to a state title for Watchung Hills. Bigsby, a senior at Montcliar who won the indoor M of C shot put winner this past winter, unloaded a NJ #1 and US #5 49-0 to smash the Group 4 record of 48-3 that stood since former state record holder Nicole Sims of Plainfield threw that in 1991. Bigsby also won the discus with a NJ #1 132-10. Loveys, a junior at Randolph, duplicated her indoor Group 4 double by winning the 1,600 and 3,200. Loveys won the 1,600 on Friday in a PR and NJ #1 4:50.53. She returned on Saturday to capture the 3,200 in a NJ #3 and PR of 10:39.57. With her XC state title last fall, Loveys has now won five state Group titles, all in this school year. Hawkins, a junior, lowered her own NJ #1 time to 11.79 to break her own Warren County record in the 100 to become the first Phillipsburg girl to win a state title on the track. This meet was off the hook with incredible performances. 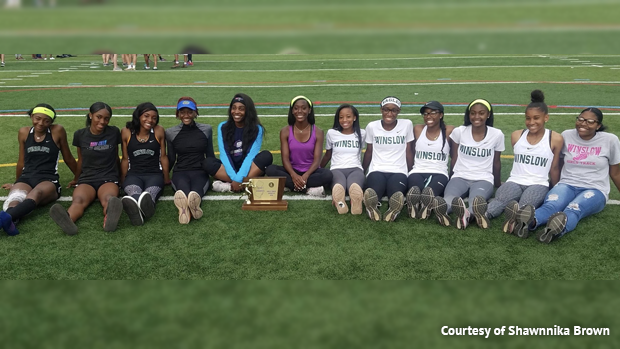 Tionna Tobias shattered the meet record (All Groups combined) in the long jump with a 19-11, and Shakira Dancy won two events to fuel the Winslow girls to its sixth title in a row, 73-42 over runner-up West Essex. The six straight titles is the longest current title streak in the state for boys or girls and is the longest ever for a girls Public School. The 19-11 1/2 by Tobias placed her tied for No. 7 in state history in the long jump. She also placed fourth in the high jump and fourth in the 100 hurdles. Tobias and Dancy, who won the 100 and 200, also teamed up on the winning 4x100 that ran a NJ #1 and All Groups meet record of 47.19. Three of the biggest stars of the meet were Reanda Richards of West Essex, Caroline O'Sullivan of Old Tappan, and Alexa Westley of Warren Hills. Richards, a senior, the 400 in 55.81, the 400 hurdles in a Group 3 record and NJ #1 58.95, and she was also first in the 100 hurdles in 14.03. Richards is NJ #1 in the HH with the 13.89 she ran at sectionals. Westley, who won the M of C 3,200 last spring as a sophomore, ran a PR of 10:34.56 to win the 3,200. Sparta, led by Gianna Macones, scored a big upset to win its first state title, and Victoria Vanriele had a fast double in the Group 2 meet. Despite not winning any events and having just three girls score, Sparta picked up 28 points from Macones, including a Sussex County record 19-0 1/2 to place second in the long jump. She was also second in the high hurdles, third in the 100, and fourth in the triple jump. Led by Macones, Sparta edged Demarest, 45-42. Last week, Sparta was fourth in NJ. Sec. 1, 31 points behind River Dell. But, Sparta avenged that loss with a strong performance. Vanriele, a sophomore at Gov. 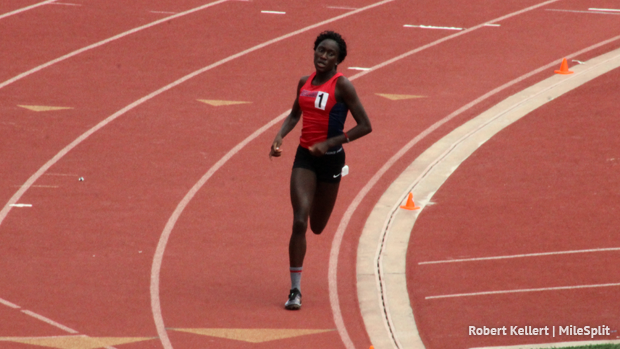 Livingston, won the 400 in 55.33 and the 800 in 2:09.73. She will be chasing the fourth M of C 800 title of her career. She has won two indoors and one outdoors. Schalick captured its first title, Elizabeth O'Connell of Glen Ridge was a double winner, and the Sharpe triplets made a name for themselves in the Group 1 meet. Schalick, led by Zyra Thomas, outscored defending champion Highland Park, 52-49, for its first title ever. Thomas, the New Balance Indoor National champ in the shot put, won the shot and placed second in the discus. Schalick also won the 4x800 in 9:48.46 and picked up crucial points in the jumps and vault. O'Connell, a senior, won the 1,600 on Friday with a PR of 5:07.44. She then raced off to the prom, got six hours sleep, and then came back Saturday to win the 3,200 with a PR of 11:34.58. A very famous last name showed up in the results for Paulboro as the Sharpe triplets, freshmen Ariel, Arianna, and Amirah, combined with Christina Franks to win the 4x400 in 3:55.54. Amirah also won the 800 in a school record 2:15.05, and Arianna placed third in the 400 hurdles. The Sharpe triplets are Fred Sharpe's daughters. Fred turned in a legendary performance when he won the 400 hurdles and the 800 and was third in the 1,600 at the 1997 M of C for Paulsboro. This meet had a little bit of everything. There was the greatest pole vault duel in state history, the dominance of Union Catholic, and the amazing performance by Tiffany Bautista of Paramus Catholic. In the girls vault on Friday, Hayley Horvath of Notre Dame and Caroline Dannenbaum of Pingry raised the bar all the way up to 13-6 as they both attempted to break the state record. Although neither made 13-6, their clearances of 13-0 smashed the All-Groups record and moved them in a tie for No. 2 in state history. Horvath, a senior, won on misses, and Dannenbaum broke the state sophomore record and is now tied for No. 1 in the nation among sophomores. The only vaulter in state history to go higher than Horvath and Dannenbaum is state record holder Danielle O'Reilly of Shawnee, who cleared 13-3 in 2004. In the team competition, UC steamrolled its way to a fourth straight title with the largest margin of victory of the day, 153-73 over Paramus Catholic. The Vikings picked up individual wins from sophomore Leena Morant, who won her second straight 800 (PR and NJ #4 2:11.33), senior Amaya Chadwick, who won her third straight HH title in a NJ #4 14.04, sophomore Sydney Tucker in the 100 (12.33) and from junior Jerika Lufrano in the 3,200 (a PR of 10:55.15). Lufrano also placed second in the 1,600 with a PR of 5:02.38. UC also smashed the meet record in the 4x100 (47.50) and won the 4x400 in a NJ #1 3:51.04. Bautista, a junior, smashed two records, including one of the best high jumper performances in state history, won three events, and just missed capturing a fourth gold. Bautista cleared a PR of 5-10 to win the high jump, which tied for No. 5 in state history and tied for NJ #1, won the TJ with a meet record 40-0 3/4, and finished first in the LJ (18-7 3/4). She also ran on the runner-up 4x100. Kaira Brown of Kent Place, the Indoor M of C 400 winner, ran a NJ#1 54.78 to capture the 400. Morris Catholic avenged its sectional loss with a dramatic two-point win and St. Rose freshman phenom Abigail Antognoli had a sensational meet. Morris Catholic, which finished third at its sectional meet (31 points behind the winner Newark Academy) placed third in the 4x400 to help secure a 64-62 win over Newark Academy. It's the second straight title for Morris Catholic and sixth overall. 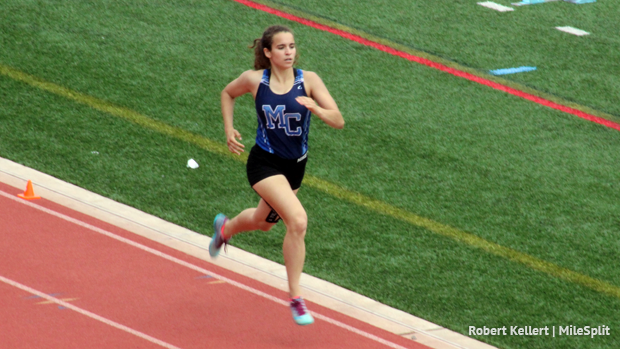 Junior Kate McAndrew, the State Non-Public B XC champ last fall, won the 800 and the 3,200, was on the winning 4x800, and was second in the 1,600 for Morris Catholic. Antognoli, a rising star, won the 400 and 1,600, placed second in the 800, and crossed the line second in the 3,200, but was disqualified for interference in the 3,200.